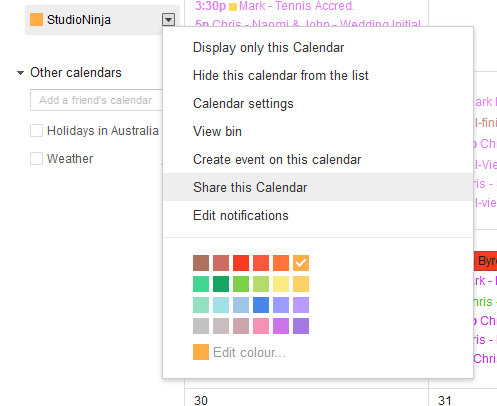 Learn how to share your Studio Ninja calendar with other people using Google Calendar. If you would like to share your Studio Ninja calendar with colleagues, staff, friends or family, an easy way to do that is to simply share your Studio Ninja Google Calendar. Step 1: Hover your mouse pointer over the Studio Ninja calendar within Google Calendar. Step 3: Add the email address of the person you would like to share your calendar with and give them a permission level. An invitation will be sent to this person asking them to join your calendar. IMPORTANT: This is also a great way to share your calendar and job details with colleagues and staff without having to give them access to your Studio Ninja account.